Life habit: lichenized, non-lichenicolous Thallus: crustose, often very extensive (up to 10 cm in diam. ), very variable, thin and rimose-areolate to warted, or granulose to coarsely warted or bullate to subsquamulose, up to 1.5-2.5 mm thick, subcartilaginous, effuse or rarely delimited by a thin, blackish prothalline line areoles: mostly contiguous, irregularly shaped, 0.6-1.5(-3) mm across, subconvex to mostly convex, uneven, but not swollen-folded surface: gray- or yellow-brown or dark brown, sometimes olivaceous or ashy gray to white or rarely brownish black, uniform-colored or mottled, smooth to rough, epruinose, usually +glossy, cortex: phenocortical, 20-30 µm thick , with a brown upper cell layer with hyphae 5-6 µm in diam., with an epinecral layer c. 10 µm thick medulla: dirty white, tinged with yellow, I-, with hyphae c. 5 µm thick; algal layer: 90-100 µm thick; algal cells: 9-12(-17) µm wide Apothecia: usually numerous, mostly crowded, immersed to adnate or constricted sessile, +round or becoming subangular from crowding, (0.4-)1-1.5(-3) mm in diam. disc: chestnut brown to dark brown or brownish black or mottled, slightly concave to flat or becoming very convex, usually darker than the margin, epruinose, usually distinctly shiny margin: distinct, concolorous with thallus, or paler, shiny, thick, entire to crenulate, usually persistent amphithecium: c. 45 µm wide, with an eucortical cortex overlain by a gelatinous layer, end cells partly with brown apical pigment caps, delimited from amphithecium by stronger swelling of the hyphae, with fine granules soluble in K, with loosely interwoven internal hyphae, in the lower part with some hyaline, plate-like crystals insoluble in K; algae scattered but forming a +continuous layer just below the exciple exciple: poorly delimited, 140-200 µm thick, with a brown ectal zone 10-14 µm thick, with hyphae 6-7 µm in diam., internally hyaline, incrusted with lichen substances; forming a 40-100 µm thick cupular layer below the hypothecium (composed of meristematic short cells 2-6 µm diam. 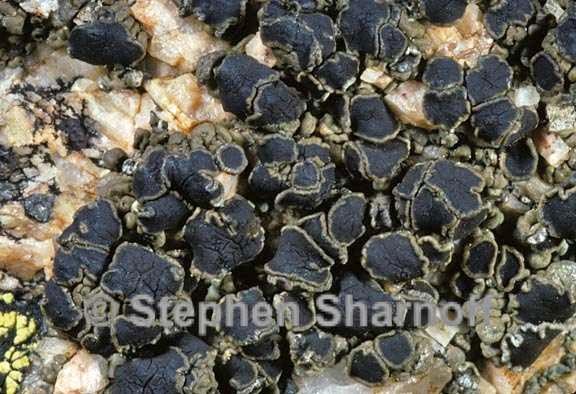 ), partly with crystals epihymenium: diffusely brown to yellowish brown or brownish olive, without granules, covered by a layer continuous with the epinecral layer of the margin, 10-20 µm thick hymenium: hyaline, (50-)60-80 µm tall; paraphyses: branched near tips, rarely anastomosing, coherent, septate, 3-4 µm wide below, with clavate to capitate apical cells 4-6 µm wide, with pale brown walls and surrounded by a dark brown "cap"; sub-hymenium: c. 20 µm thick; hypothecium: hyaline or pale yellow, 80-100 µm thick, with hyphae 3.5-5 µm in diam. asci: swollen-clavate, 35-60 x (7-)13-16 µm, 8-spored ascospores: hyaline, simple, oblong-ellipsoid, ellipsoid-fusiform or fusiform, 8-13(-16) x 3-5(-8) µm, with thin walls (0.2 µm thick) Pycnidia: often present, rarely abundant, immersed, ostiole black, punctiform conidia: hyaline, straight, acicular, pleurogenously formed, 6-9(11) x 0.7-1.2 µm Spot tests: thallus and medulla K- or + pale yellow, C-, KC+ fleeting pink to red-violet or brownish red, P-, usually UV+ white Secondary metabolites: lobaric acid, +zeorin, and 3(-5) unknowns, sometimes with usnic acid. Substrate and ecology: on hard, usually exposed acidic rocks (granite, basalt and other volcanic rock, rhyolite, sandstone), on cliffs or large boulders, occasionally overgrowing other lichens rarely spreading to detritus at high elevations, in coastal and montane to alpine sites World distribution: circumpolar arctic-alpine, common and widely distributed in western or northeastern North America, and montane areas of Europe, Asia, temperate South America, Australasia, and Antarctica Sonoran distribution: in montane areas of Arizona, southern California, Baja California, and Chihuahua from 2200 m to alpine areas. Notes: Protoparmelia badia is characterized by the pointed ascospores and the occurrence of lobaric acid +zeorin. It is rather variable in color and morphology, on which infraspecific taxa are sometimes distinguished The areoles can become highly convex when growing on overhangs. The thallus surface is sometimes +white due to a strongly developed epinecral layer.